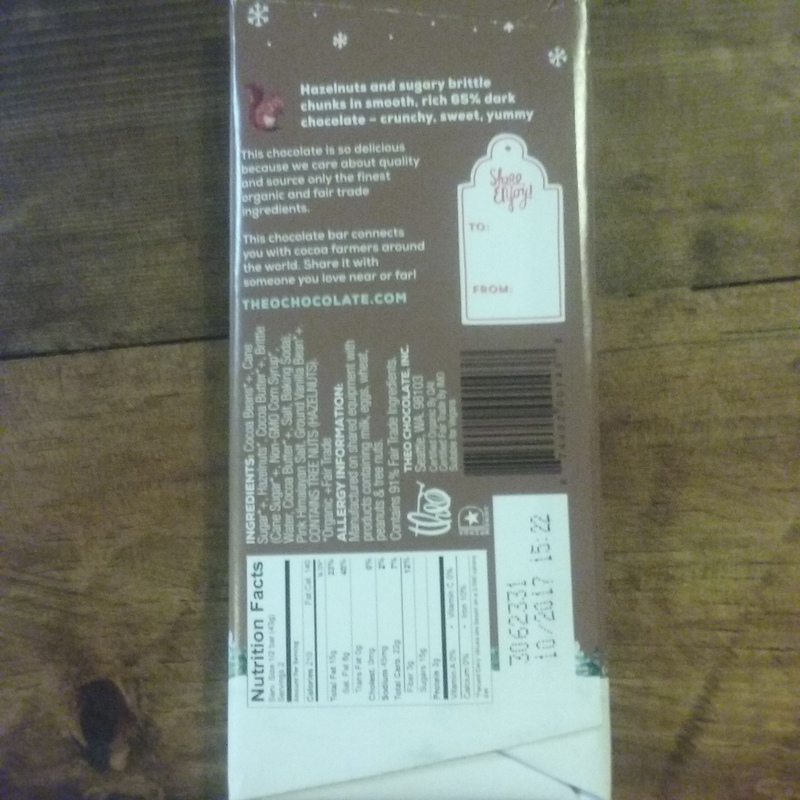 This one is a seasonal bar that I picked up at my local grocery store. 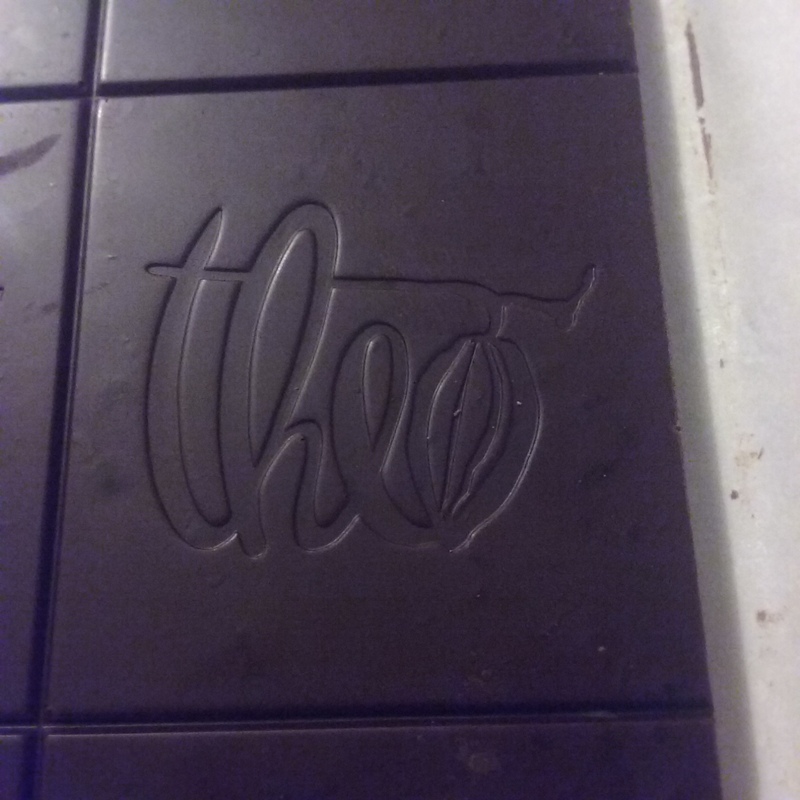 They carry Theo bars year round, though. This bar is very much holiday themes with the snow flakes and the Nutcracker on the front. Also I can’t think of any other time of year besides the holidays when people eat brittle. 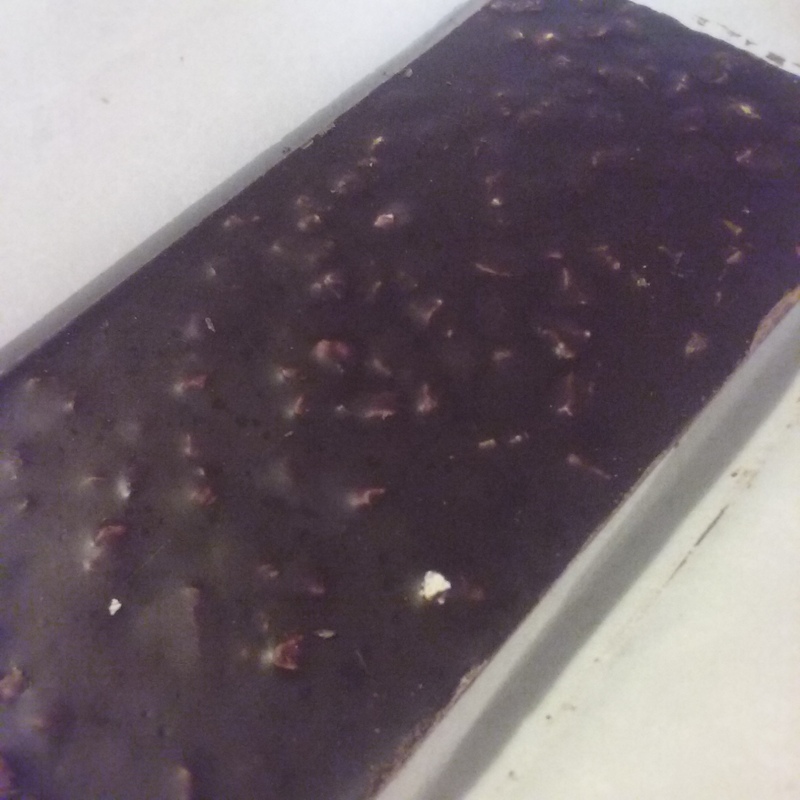 This bar features a hazelnut brittle instead of a typical peanut brittle. So unwrapping. The back of the bar isn’t very pretty. It’s cloudy and doesn’t have a nice sheen to it. It’s definitely nutty though you can see that right off the bat. There’s also a nice hazelnut smell as well. The front is also kind of cloudy as well and not a flat consistent color. The little squares are cute though. They don’t break along the lines though, probably because the scoring between squares isn’t very deep. The first thing I tasted in this bar was actually salt. Not overwhelming but definitely there. Then came the nuts. They don’t taste like they have been toasted and have a pretty mild flavor. I’d have preferred something a little!e stronger tasting but I really like hazelnuts. 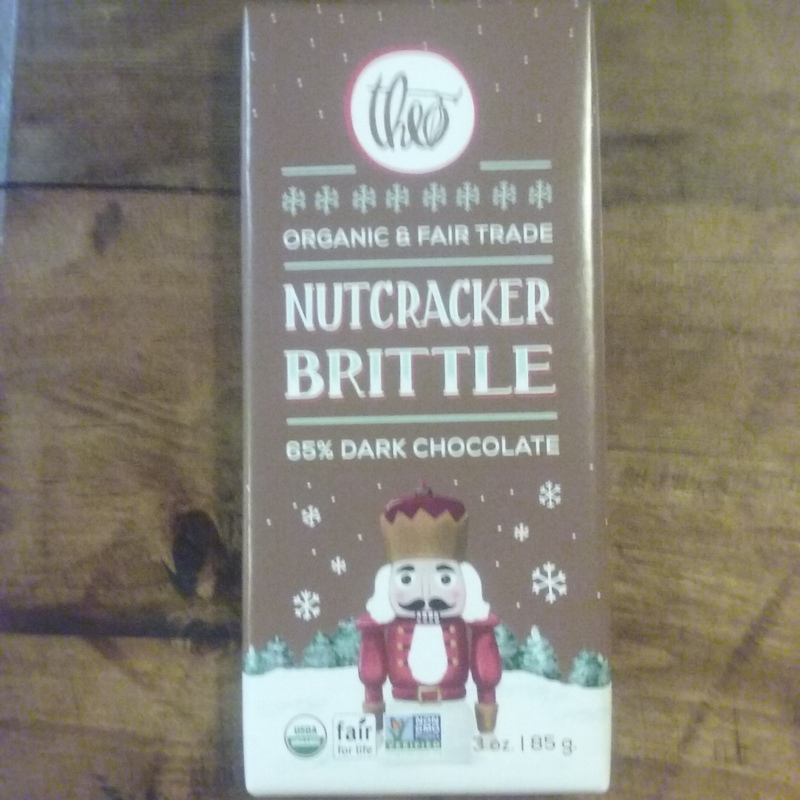 There are supposedly brittle bits in this bar as well but I couldn’t taste them or notice them in the bar at all so on that point I definitely felt the bar was lacking. Looking at the ingredients I was interested to see if they used cocoa butter in the brittle which even if I wouldn’t really taste it, thought that it was an interesting choice. The bar also contains a mall amount of vanilla which helps lend to its sweetness. It may be in the mid 60’s of percentage but it’s not bitter at all. Definitely a holiday kind of bar. The chocolate flavor itself in this bar wasn’t anything to write home about either. It served as a good base for the hazelnuts but didn’t really shine through in any special ways. The chocolate is smooth and not gritty and that’s good. This is a cute holiday bar overall. It’d make a cute gift(made easier by the two and from tag on the back). I don’t think anyone would be upset to receive it unless they really didn’t like hazelnuts. 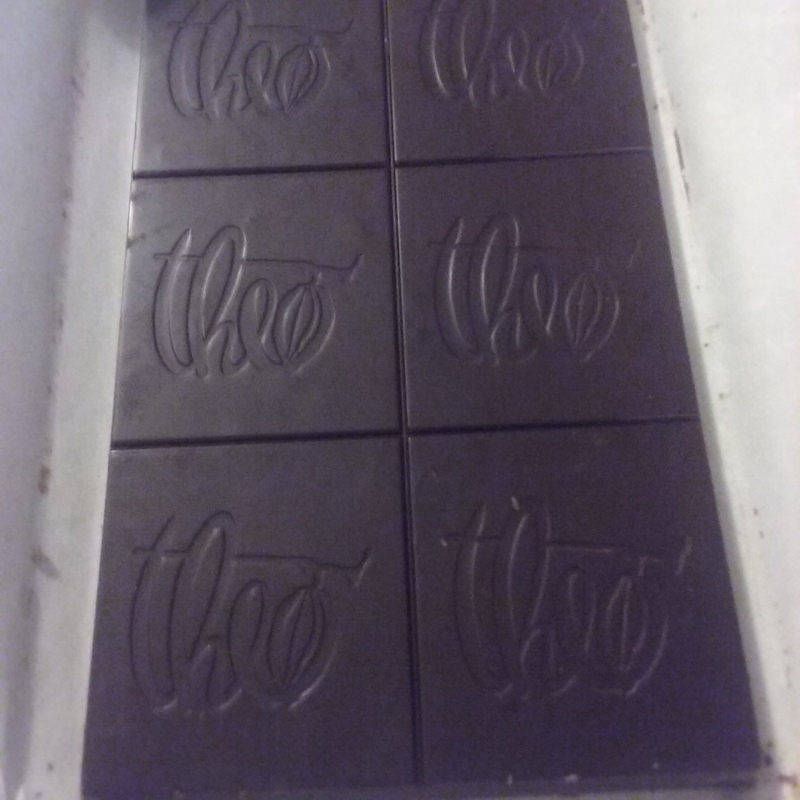 Posted in UncategorizedTagged 65% Cacao, Brittle, Dairy Free, Fair Trade, Hazelnut, Himalayan Pink Salt, Non-Gmo, Organic, Theo, VeganBookmark the permalink.